"Brothers and sisters, we live in a mortal world with many songs we cannot or do not yet sing. But I plead with each one of us to stay permanently and faithfully in the choir, where we will be able to savor forever that most precious anthem of all—'the song of redeeming love' (Alma 5:26; see also Alma 26:13). "Fortunately, the seats for this particular number are limitless. There is room for those who speak different languages, celebrate diverse cultures, and live in a host of locations. There is room for the single, for the married, for large families, and for the childless. There is room for those who once had questions regarding their faith and room for those who still do. There is room for those with differing sexual attractions. In short, there is a place for everyone who loves God and honors His commandments as the inviolable measuring rod for personal behavior, for if love of God is the melody of our shared song, surely our common quest to obey Him is the indispensable harmony in it. "With divine imperatives of love and faith, repentance and compassion, honesty and forgiveness, there is room in this choir for all who wish to be there. (See 2 Nephi 26:33.) 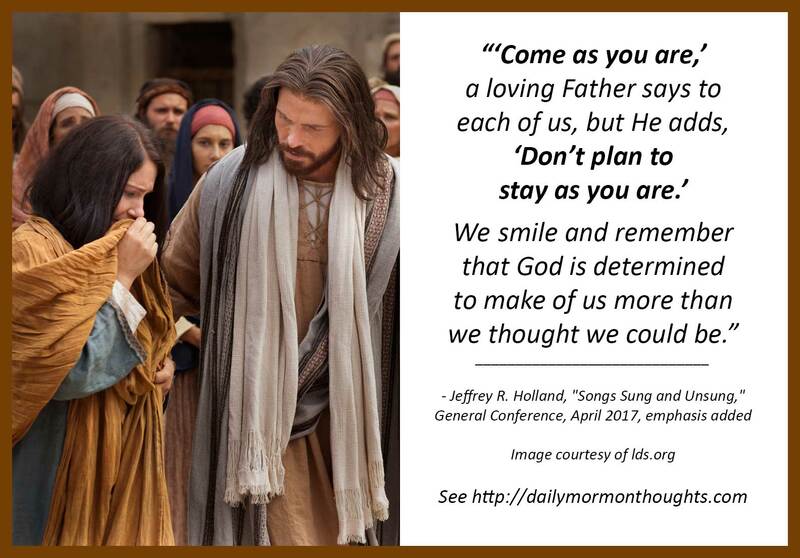 'Come as you are,' a loving Father says to each of us, but He adds, 'Don’t plan to stay as you are.' 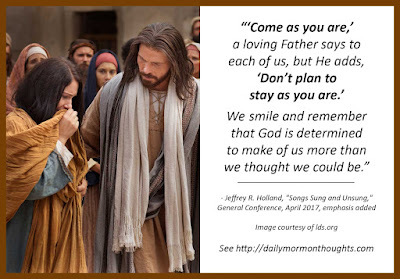 We smile and remember that God is determined to make of us more than we thought we could be. "In this great oratorio that is His plan for our exaltation, may we humbly follow His baton and keep working on the songs we cannot sing, until we can offer those 'carol[s] to [our] King.' (Hymns, no. 227.)" 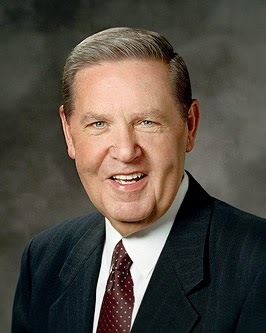 In this sermon, Elder Holland spoke beautifully based on the lyrics of the hymn "There is Sunshine in my Soul Today" (Hymns, no. 227). He drew a number of comparisons and analogies that were helpful in thinking about how we confront the challenges of this life. I thought this section, near the end of his talk, was particularly interesting. He points out the importance for "each one of us to stay permanently and faithfully in the choir" (the symbolic description of faithful discipleship) as we deal with our various situations. And he points out that diversity of needs and backgrounds, of personal situations, is not only acceptable in that "choir," but also very desirable in the formation of the choir. "There is a place for everyone who loves God and honors His commandments as the inviolable measuring rod for personal behavior." I hope all members of the Church can feel the power of this message, knowing that not only are we personally needed and wanted in that choir, but also we should be open, welcoming, and loving to all those who likewise come to receive the blessings and benefits of singing together with us.